The Traditional Parenting Program proudly presents our annual Medicine Harvest & Making Workshop! Day 1 (July 10th): Everyone will be meet @ Skookum Jim Friendship Centre by 9:00 AM & returning by 4:30 PM. We will go out on the land to gather traditional medicine for the full day. 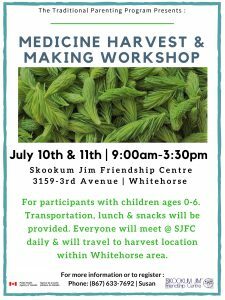 Day 2 (July 11th): Everyone will leave @ Skookum Jim Friendship Centre by 9:00 AM & returning by 4:30 pm. Everyone will travel to harvest camp on Fish Lake road and will be making medicine for the day. Refreshments and food will be provided. Please call 633-7692 to sign up Susan or Gayle.